PennsylvAsia: Demonstration for Sewol victims, May 18 at Schenley Plaza. Demonstration for Sewol victims, May 18 at Schenley Plaza. 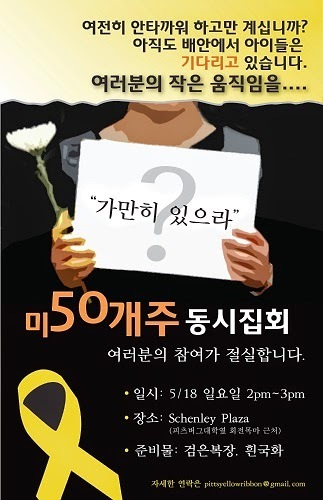 A demonstration is scheduled for May 18 at 2:00 pm in Schenley Plaza for the victims of the Sewol ferry tragedy. Pittsburgh's event coincides with simultaneous nationwide demonstrations here in all 50 states. Attendees are asked to wear black and bring white chrysanthemums. The Sewol was a ferry boat that sunk off the coast of South Korea on April 16 while carrying passengers and cargo between Incheon and Jeju. The majority of the passengers were students from Danwol High School on a school trip; of the 281 deceased, 250 were from Danwol High School. Since then, protests against perceived government incompetence and obfuscation have erupted in Korea and among Korean expatriate communities abroad.